Enjoy the wondrous texture of Baby Alpaca in a remarkable form. The ingenious construction of this yarn will have you questioning the meaning of "bulky". 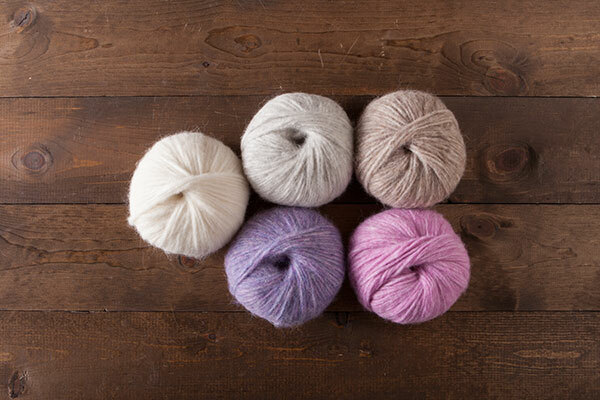 Enjoy a selection of colors as soft and delicate as the yarn they bring to life. Explore these free patterns designed especially for Wonderfluff. 5 full-sized balls of Wonderfluff (1 each of Bare, Finnley Heather, Hare Heather, Larkspur Heather, and Sweet Pea Heather). Love this yarn. I knitted mittens. Then felted them. So soft. ?????? Just ordered Wonderfluff (3 skeins of Bare) for the first time to make a scarf! So extraordinarily soft, just loved it so much that I just ordered enough to make 4 more in different colors for my daughters! It works up nicely, I was very careful so that I didn't need to rip out any stitches, that would be my only concern. I used "The Merry Hobbit" pattern by Morgan (knitcraft & knittery).